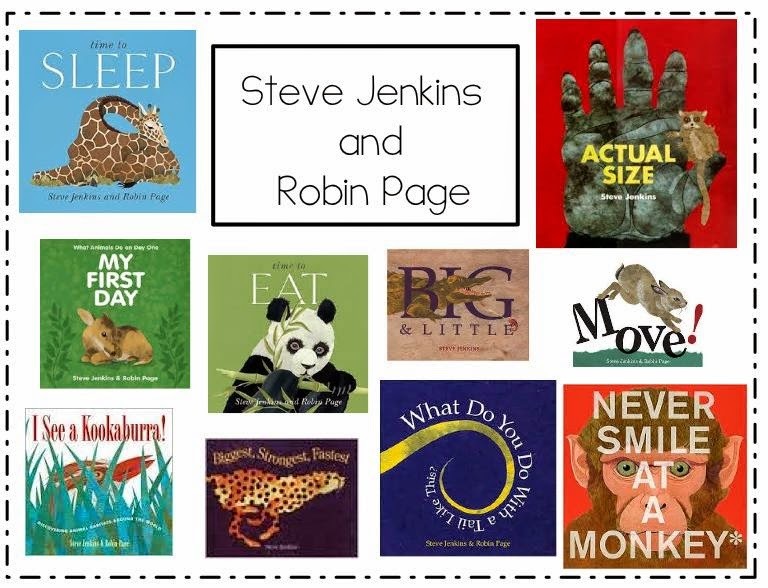 Steve Jenkins and Robin Page have published so many beautifully, written nonfiction books together. To my surprise, when I visited Steve’s website, I learned that they are married. Every year, I enjoy sharing their books with my class you can quickly tell a book illustrated by Steve because of his collage style. Beautiful, unique and creative are the words that come to my mind when I look at his illustrations. If you visit his website, he has a video demonstrating the process he goes through to make his books. One of my students said, “Wow Mrs. Clancy it takes A LOT to make a book.” His website is loaded with information about his work process, his strong interest in science and where he gets his ideas. I think all of this is so important for children to see and hear. Some kindergartener’s think books just come from the bookstore. During the month of March, my students started writing “Research/Informational ” books about animals. 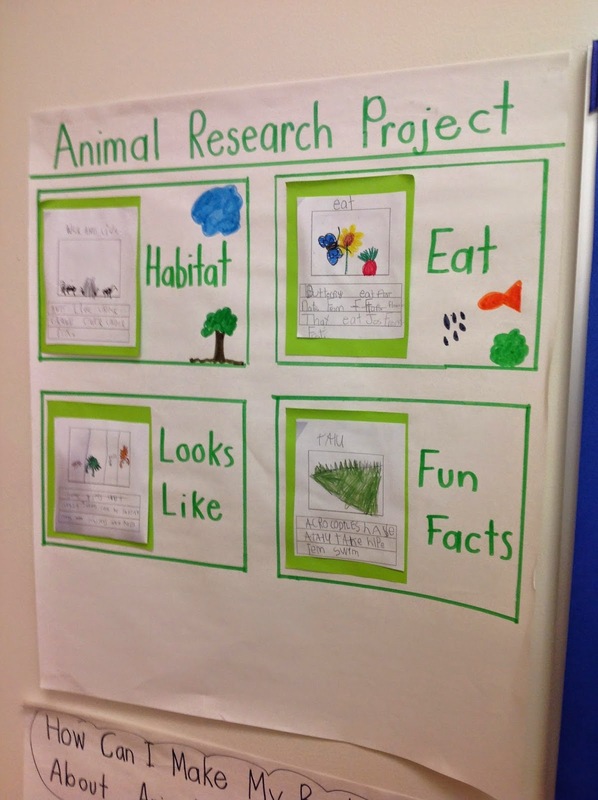 Students had to write about what their animal looked liked, where their animal lived, what their animal ate and any interesting facts. Of course, one child in my class changed interesting facts into FUN FACTS. This year I decided to have my students look closely at Steve’s books. Could we maybe find something that he does in his books, that we could do in ours to make our books even better? And also, talk about WHY he makes these decisions as a writer. What affect does it have on us a reader and writer? This is called “Reading like a Writer.” Katie Wood Ray (an author who I admire) has an amazing book called Wondrous Words that is all about this BIG idea. The first book I shared with my class was the book ActualSize. We began by looking at the cover and making predictions about what this book could be about. A child immediately predicted that the hand on the cover could be the actual size of an animal hand. As we looked over his book we talked about what we noticed. There were lots of discoveries and amazing facts learned. On page 5 there’s a huge picture of an bears head, to think an animal has a head this big! The next day, during writing time, a child in my class made a butterfly wing that covered the whole page she ZOOMED in on the scales and pattern of the wing. When I noticed this, I immediately asked the child to share and as a class we gave Aila’s idea, a name. We called this ZOOMING in. WOW, Aila, you did your picture just like Steven Jenkins (take book out)…you zoomed in. This picture is going to help the reader really understand what a butterfly’s pattern looks like. The next day, room 5 was reminded of Aila’s idea of ZOOMING. Before sending students to tables, we took one last look at Aila’s picture as a reminder. Students turned and talked to a partner about how they might use the technique of ZOOMING in on an important part of the story. Mary shared how she might ZOOM in on the pink tongue of her frog because that’s how the frog eats. On that day, half of my class used the strategy of ZOOMING in and their illustrations were so unique and beautiful. Although we did this lesson a few weeks ago, many students are using this technique of ZOOMING. 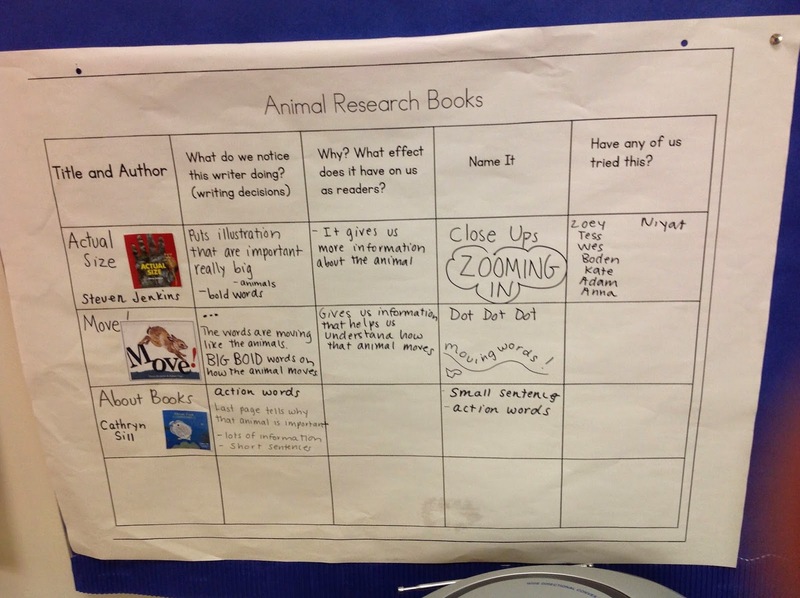 On a different day, we took out our Animal Research books, and we added a moving sentence about the animal. As a class, we called this MOVING words. Why would we add moving words? Adding actions to our words and animals always helps the reader get a better understanding. Here are the things we noticed about their books. *The pictures are a collage of animals. * There is usually a word pattern in his books about the animals. *He gives lots of information. *He writes about important features of animals. * You can find out more information at the back of his books. Love the term moving words! I am so adding this term to our list of nonfiction text features. 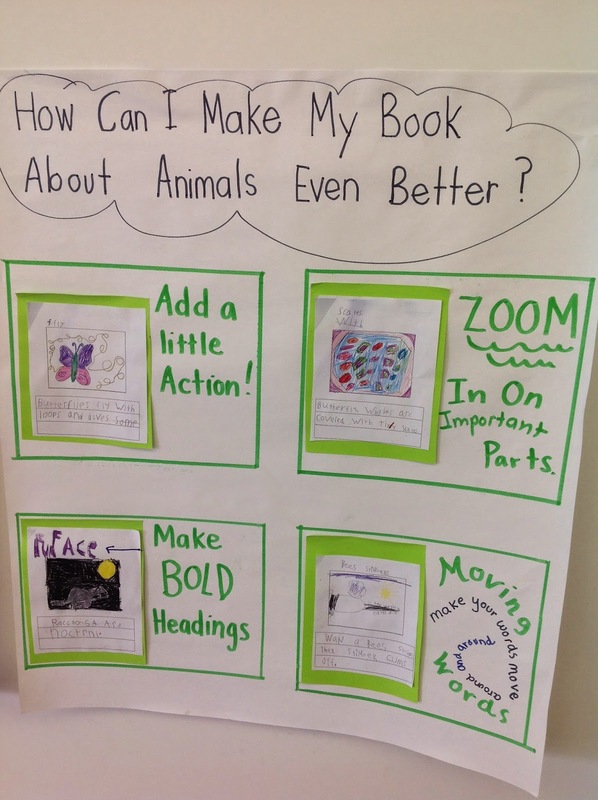 Excellent Moving book you and your kids made! I love it! Can you explain how you got the book onto your class website? I would love to try it! 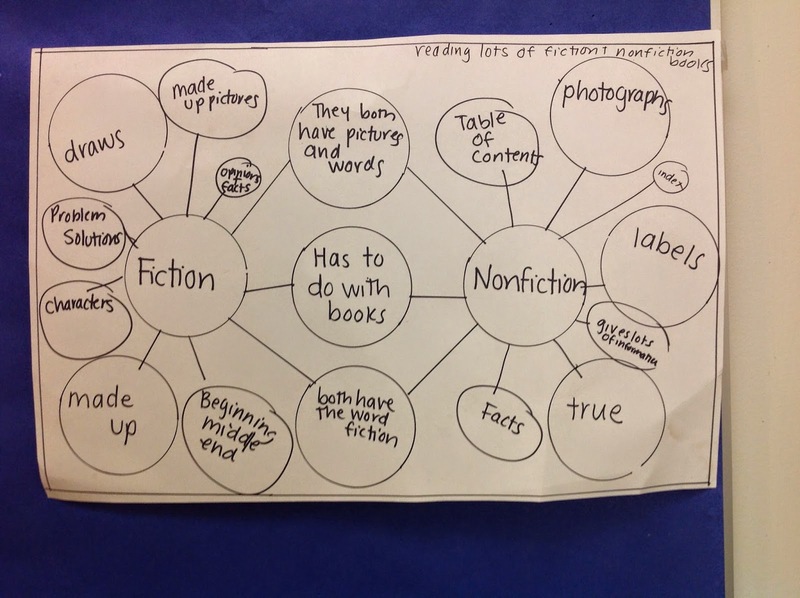 Thanks for some new ways of looking at non-fiction! Your writers are going to be so prepared for first grade writing. How lucky they are! For the Moving Book on my class blog I used Simple Booklet you can join for free but they do have a teacher account I think it is for ten dollars a year...you can also download projects (PDF) and print them too! What an informative post!! Thanks for sharing! !